Today, the day after Epiphany, we took our first Christmas tree on top of the “Mountain” down. Our first Christmas on top of the “Mountain” was spectacular and wonderful. All but one of our five children were here to enjoy this special time of the year with us and both of our grandchildren were here, as well as Cousin Henry, Trish, and Jay. 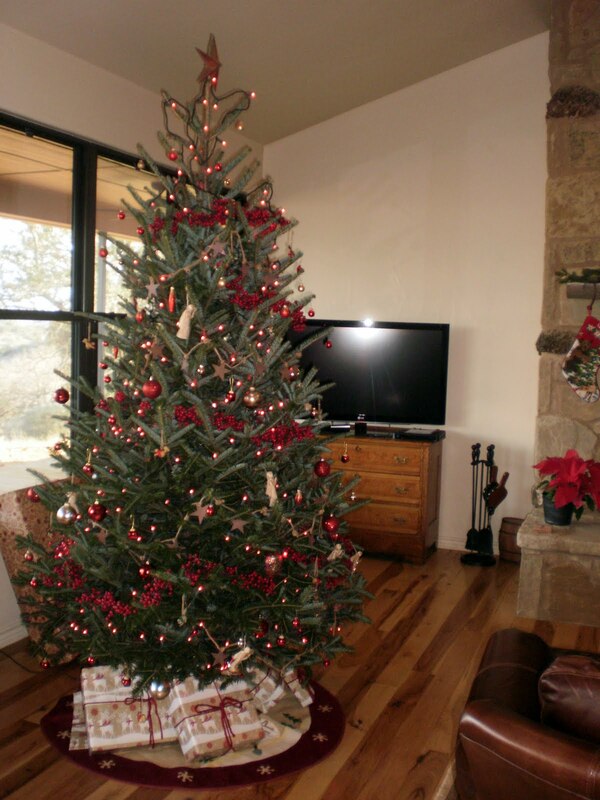 The tree was a 9 or 10 feet tall pine. Formerly we cut a live cedar (Juniper) tree in the pasture for our Christmas tree, but the girls and my husband are a bit allergic to cedar, so this year, we bought a traditional pine tree. I must admit I miss the smell of a cedar tree brought in from the pasture. The smell is so strong and so heavenly and reminds me of my childhood when Daddy and I would go in search of a tree for our house and for my grandmother’s house, and for my bedroom. We would come back with three sizes of trees. A giant one for our house, a medium-sized one for Granny’s, and a tiny one for my bedroom. I have always loved cedar trees, but all of the ranchers in this rural area despise them because they soak up a tremendous amount of precious ground water, and apparently, they are good for nothing! Nothing likes to eat them, and they grow like bad weeds. Well, I guess they are bad weeds! 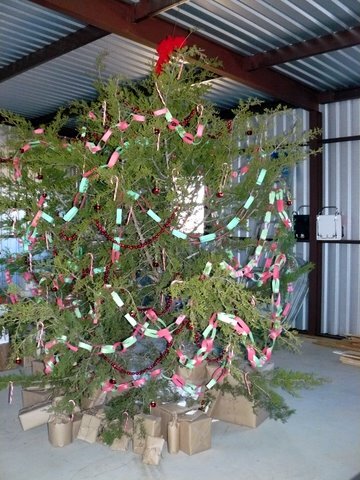 The second photo is of the last cedar tree we had when we still lived in the cabin, but had our Christmas in the barn. Of course that was before the barn was full of “stuff”. I must admit that making paper chains, hanging candy canes and bells, and wrapping our presents in brown mailing paper with twine tied around them was a blast! The oil candles were fun, too. It was a little chilly in the barn since we didn’t have much in the way of heat or light. We did have some Coleman lanterns hanging from the ceiling. I hope you have special memories of a special tree, and these two trees will always be very special to me!